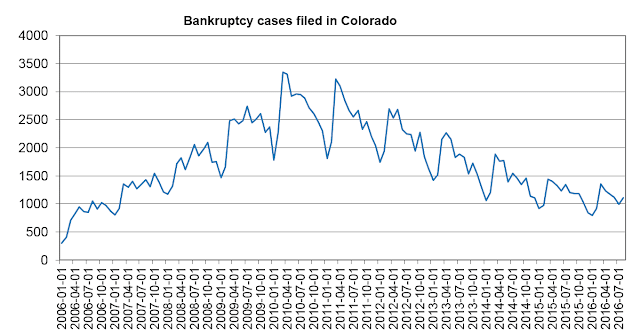 According to federal bankruptcy court records, there were 1,106 bankruptcy filings in Colorado during August. That's up 11 percent from July's total of 990, and it's down 8.5 percent from August 2015's total of 1,208. It remains to be seen whether or not this signals a change in the downward trend we've seen seeing for the past six years. 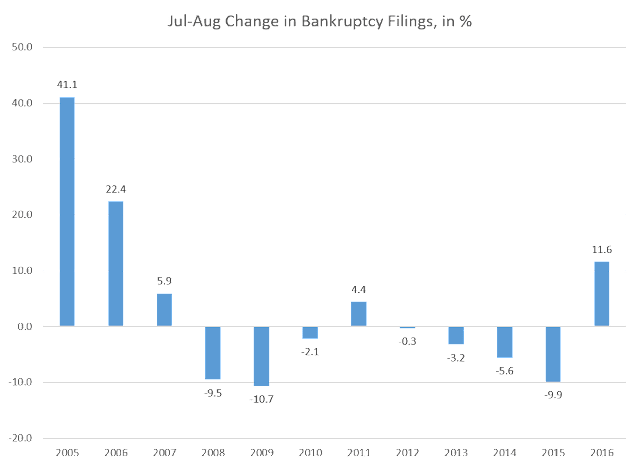 There have been other indicators, though, that this year bankruptcy activity has been leveling off, rather than continuing the sharp down ward trend that we saw from about 2012 to 2015. 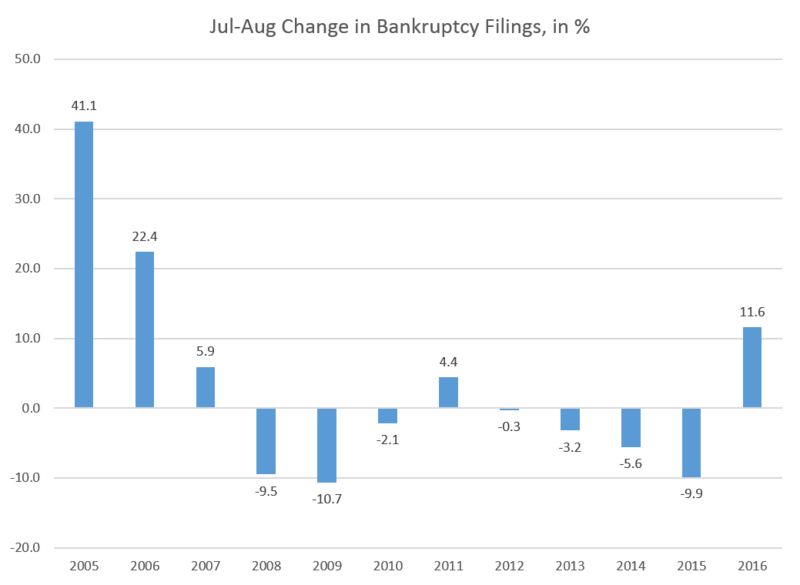 The next graph shows how year-over-year changes in bankruptcy activity has been rather sizable with year-over-year declines of 20 percent or more being rather common. So far, this year, the degree to which filings have been declining become smaller compared to 2015. From August 2015 to August 2016, bankruptcies fell 8.5 percent. From August 2014 to August 2015, bankruptcies fell 16.9 percent. 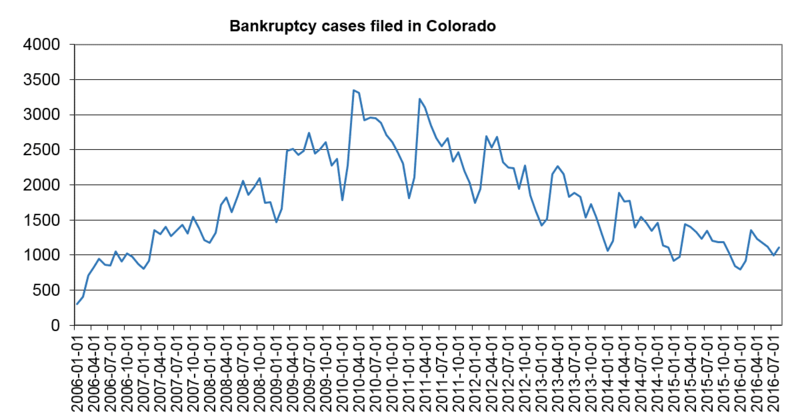 Are bankruptcies surging in Colorado? At this time, there's not enough or an established trend to say this, although the most recent data may suggest that the most robust portion of the current expansion may be softening.